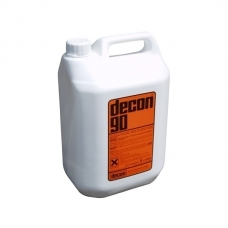 Decon 90, laboratory detergent, phosphate-free surface active cleaning agent and / or radioactive decontaminant, liquid concentrate (for dilution with water), biodegradable, bactericidal, non-flammable, totally rinsable, also suitable for medical and / or specialised industrial applications, 5L, plastic bottle, pack of 1, Decon Laboratories, Decon 90, D905. › Click here to download the MSDS for this product. › Click here to download the Technical Specification for this product. LabShop supplies the complete Decon product portfolio. If you cannot find the specific Decon item(s) you require within the LabShop web catalogue range, please contact us for price and availability.